The water-immersion (Hydro Graphic) process at Ground Effects is an image-transfer system that instantly imprints any color, design or pattern to a customer's non-porous product. Through a 7-stage process Ground Effects can turn your current product into an offering that is both striking in appearance and extremely durable for consumer or commercial use. 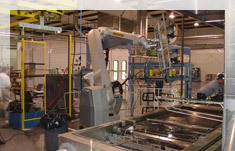 The class "A" E-Coat and Powder Coat Facilities incorporate two fully-automated systems. The E-Coat process utilizes an indexing 12-stage line, utilizing the latest paint transfer technologies. Our variable-speed Powder Coat line boasts the use of a 6-gun automated ITW Gema booth with an incorporated reclaim system, minimizing our spray to waste. Another surface coating product is our proprietory Polyurea coating that is used as a spray-on bedliner for it's lining and joint sealant technology. Polyurea coatings and linings are fast-setting, have high elongation and high durability and abrasion characteristics.